Here is a picture of a drum I made way back on December 12th, 1975 (A year out of High School) My sister owns it now. 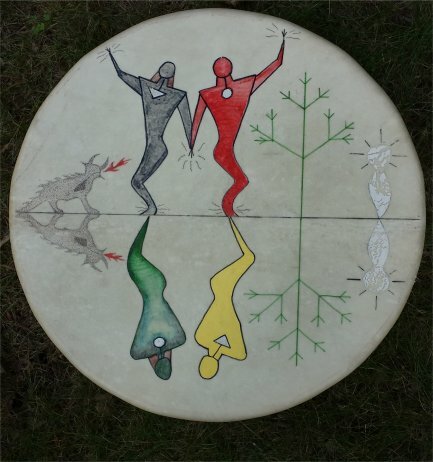 In a somewhat stylized painting of Anishinabeg drawings, it represents the people of the four directions: Red, White, Black, and Yellow; while also representing the four directions themselves. Note: I believe it is ok to use this style of drawing in one’s art because the symbols had individual meaning and were the property of their owner and were passed to another as such. They did not have a universal meaning. And, as long as one does not try to pass oneself off as being a Mide’ (unless you are one) this style of drawingis a part of being Anishinabeg. The horizontal line through the middle represents the separation between the world of the living and the world of the dead. The accent lines pointing to the hands and feet of the man and woman in this world represent their power to move, act, etc., in short, their power to do everything that a person with a body can do in this world. Notice that the spirits of the man and woman do not have hands and feet, which signifies that they lack some of the power that comes from having a body in this world. On the left is a drawing of Mishipeshew-the great water Lynx. He represents an evil spirit. The red fire coming out of his mouth represents “the fiery darts of the adversary”, which tempt the people of the world. Note the line coming from his heart to his mouth. This is called the heart line, and it also represents that what comes out of a person’s mouth comes from his heart. Mishipeshew is also reflected in the spirit world to represent that he has the power to influence the spirits of people there as well. The tree represents the tree of life, which is a symbol of the gospel of Jesus Christ. (I believe that many of the Mide’ symbols are remnants from the time that Christ visited this continent.) It exists in this world and in the spirit world. I bet it sounds as good as it looks too! Thank you for your kind comment Daisy!